Have you ever wanted to see turtles in the wild, but you were worried that doing so would interrupt their natural habitat? If so, then you may want to add Heron Island to your travel bucket list, as this beautiful part of Queensland offers an experience like no other! Providing safe and sustainable breeding grounds for Green and Loggerhead turtles, the tropical beaches of Heron Island are fast becoming a must-visit for curious souls who are interested in witnessing one of nature’s most remarkable journeys. Heron Island’s beaches, located off the coast of Queensland, are reminiscent of paradise – both for you and the diverse wildlife that calls this part of the world ‘home’. As the site of both the Heron Island Resort as well as its own National Park, the island is a dream getaway for people who come to experience its unique and biodiverse ecosystem in all its splendor, as well as for the scuba divers and snorkelers eager to explore the nearby reefs. As a traveler to the island, you’ll find yourself gifted a first-hand view of the famous migrating turtles who arrive to lay and hatch their eggs, as well as of the local sea life, all from one of the most natural and breathtaking coral cays in the world. Each year, between the months of October and April, Heron Island plays the role of breeding ground to countless Green and Loggerhead turtles, and of course, their hatchlings. While this is amazing in itself, the turtles aren’t merely arriving on the island for the first time. Rather, they’re completing a wonderful and unbreakable cycle, 30 years in the making. The turtles are born on Heron Island and they return about 30 years later, ready to lay their eggs and complete the circle of life. This annual phenomenon is a sight not to be missed, particularly when the migrating turtles and their hatchlings join the 4,000 local turtles who permanently reside on the island. As General Manager of Heron Island Resort Sandy McFeeters shares, there’s no other sight quite like it. “Heron Island is truly an amazing place to be part of the annual laying and hatching of the Green and Loggerhead turtles,” she says. The see this incredible hatchling happen in front of your eyes, all you need to do is wait for a couple of hours after the evening’s high tide and then walk along the peaceful Heron Beach. When you spot a couple, you know you’re near babies as well. Remember to keep an eye out for the tracks in the sand, which show where the turtles have emerged from the ocean. Be sure to focus on the hatchlings, who will rush toward the safe ocean once they have been born. Heron Island is a part of the Great Barrier Reef and sits on the western side of Heron Reef, about 85km off the coast of Australia. Technically a part of one of the seven natural wonders of the world, the island and its surrounding reefs are popular tourist hotspots. This makes Heron Island the perfect blend between a serene island escape and a humming destination with enough excitement to quench any thirst and warrant a visit! You can visit the island as a one-off adventure, or combine it with an exploration of other nearby island destinations. The Whitsundays nearby is comprised of more than 70 islands ranging in size and amenities, so there is plenty to do in this part of the world if you want to explore! If you do decide to make a beeline for Heron Island, not only is it easily accessible to visitors (whether they’re coming over for the day or are guests at the resort) but there’s also plenty to do in between watching the turtles. Even if scuba diving isn’t your idea of a relaxing time, grab yourself a snorkel and discover the natural masterpiece living below the water’s surface. Keen to visit a tropical island in Queensland but Heron Island doesn’t quite tick all the boxes for you? Consider exploring the beautiful white sand beaches of the Whitsundays, or the stunning far north Queensland destination of Port Douglas. Discover the pros and cons of each destination here! How Do You Get to Heron Island? Regular flights run from all Australian capital cities to Gladstone or the drive from Brisbane will take you around six hours. You could pair your visit to Heron Island with a few nights in Brisbane, so you get to explore the city and the coastline in one trip! 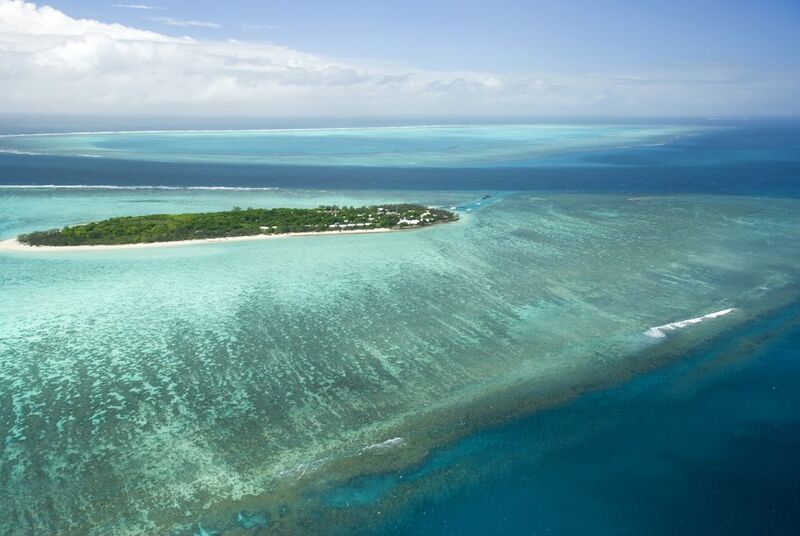 To celebrate the wonder that is Heron Island, you can arrange a stay on the island at the on-site resort. There are a number of accommodation options, including a freestanding home you can rent out for the duration of your stay! Children are very welcome for those who are planning a family holiday and in most cases, kids under 12 are allowed to stay for free. Will Your Visit to Heron Island Harm the Local Ecosystem? Importantly, the people who run Heron Island are fully aware of the impact that human traffic can have ​on the local ecosystem. As a result, Heron Island has partnered with the Sea Turtle Foundation, a non-profit organization that is dedicated to safeguarding sea turtle populations, migration routes, and habitats. Though sea turtles have been swimming in the world’s oceans for over 120 million years, today’s turtle populations face an uncertain future. Heron Island is committed to educating people and protecting the beautiful Green and Loggerhead turtles. They do this by giving guests a number of opportunities to learn, through guided walks, information sessions and junior ranger programs, to help guests understand and support these amazing creatures. Cairns vs the Gold Coast: Which Is Best? What Are the Capital Cities of Australia?